When our family first started talking about living a more self-sufficient lifestyle, we began to find a lot of information related to being prepared for emergencies and catastrophes. We quickly realized that prepping was related to living a self-sufficient lifestyle and was valuable in planning for situations where survival is more important than the simple creature comforts. To help us put together the whole picture, we tried reading everything we could about it. We started to view ourselves as new preppers, and tried to find resources that we could use to educate ourselves. During our searches, we found a fantastic and comprehensive website that provided extensive information that is ideal for new preppers. 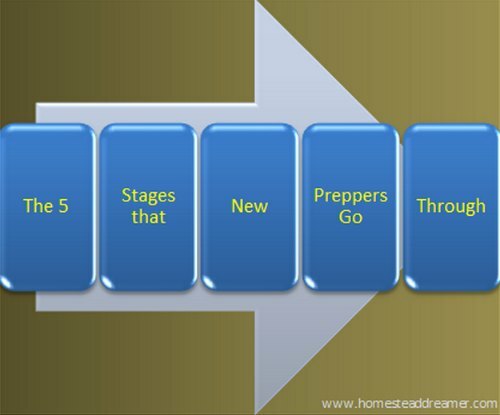 It even broke down a lot of the information into stages that new preppers go through. This helped us to put much of the information into perspective and to start establishing a solid foundation. Of course, we knew that we wanted to be ready for any emergency that could come our way, especially since we had been reading and seeing on so many natural disasters on television that had befallen so many people in the past few year. From fires, floods, tornadoes, hurricanes and snowstorms, to earthquakes and tsunamis, there was certainly a lot of information for new preppers to think about. Every one of them seemed to bring about a loss of power that lasted, in some cases, for days or weeks. And, let’s face it, a nuclear war would bring about much worse. We know how hard it is when the power goes down for just a few hours in our household, we couldn’t imagine being without our creature comforts for longer periods. We really had to do something to be prepared, so we became new preppers and started working on our preparedness level. We knew it wouldn’t happen overnight, so we started with baby steps, like water storage, canned foods, and a whole-house generator.